Home > Heirloom > 366 Liberty Landing 16" x 20"
366 Liberty Landing 16" x 20"
This New England cross stitch stamped sampler features a seaport design by Betsy Coogan.The idea came while visiting Salem , MA. 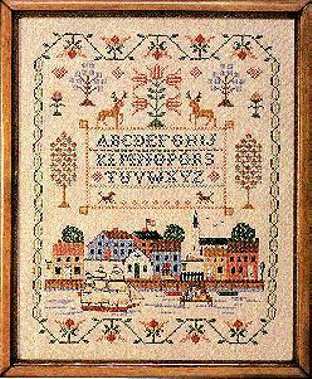 This printed cross stitch sampler kit is a treasure for all who cherish the Colonial Era. It had been 35 years since I did a sampler. This is the second one I've done from Country Stitching. I love the antique patterns. I've been looking all over for these patterns. I will look no further. I'm happy I found Country Stitching!!! When I got my two sampler kits in the mail, I couldn't wait to get started, and this one got finished first, to my entire satisfaction. The linen in this kit was great to sew on, and thread was in more than sufficient quantity to finish, and framed, it looks great in my office! You can be sure that I willbe ordering from you again soon. Another beautiful sampler from Country Stitching. This will be the eighth one I've completed, and each one is just as gorgeous as the one before. I can't wait to start!